No 1 in Italia. Suitable for vegetarians.Our classic mascarpone is a velvety smooth, soft cream cheese, churned from cow's milk and cream. 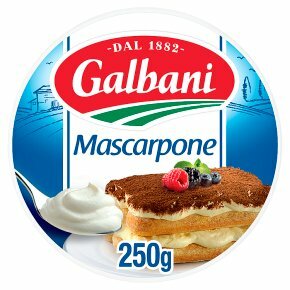 Use our mascarpone in your next tiramisu, or stir into a classic tomato sauce and serve with pasta for an indulgent meal the Italian way. Made with pasteurised cow's milk and cream. Suitable for vegetarians. Galbani is Italy's favourite cheese producer, crafting many of Italy's most loved cheeses since 1882.